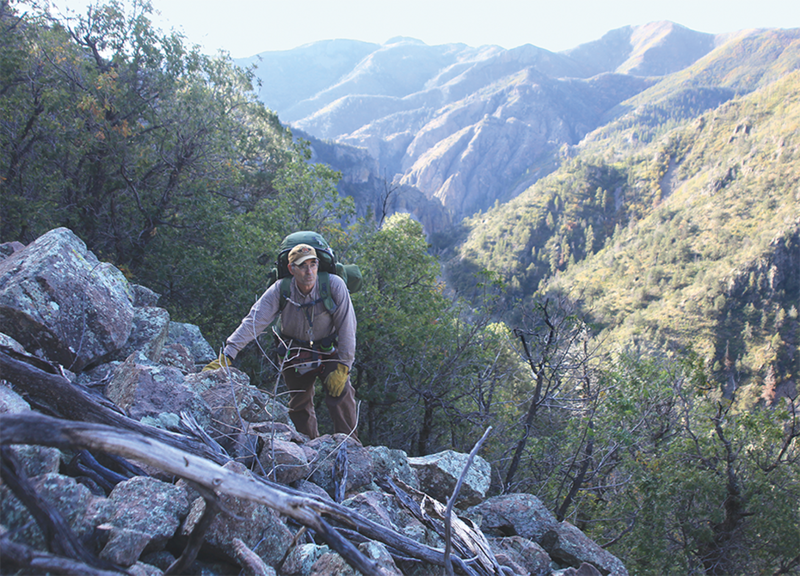 Over three decades ago Larry Ditzer and myself began exploring the higher elevations of New Mexico's remote Black Range in some of the roughest country imaginable. We were were searching for an old cannon that cowboy Walt Nichols had accidently stumbled upon in the 1950s in these same mountains. One day while working cattle up near the Continental Divide, Walt had gotten off his horse to look for a stray. Walking out on a high bench covered with large old growth aspens he was stunned to see an old cannon sitting amongst the trees. Years after Walt rode off into his last sunset Larry and I found the location of his old cannon. We never dreamed that it would point to a far more interesting yet tragic story that had taken place many years ago in the Black Range. We were to eventually discover that Walt's old cannon had once guarded one of the richest and most sought after lost gold mines in all of the Southwest- the Lost Adams Diggings. In 1863 shortly after Adams and 21 of his men found and began mining her fabulous wealth Apaches brutally massacred everyone except for three of the men. Miraculously Adams, John Brewer, and Jack Davidson all escaped. Only Brewer who kept the whereabouts of the mine secret until his death was able to find the location again and pack out some of the gold. This gold mine dated back to the Spanish Conquistadors who had worked it prior to the Pueblo Revolt which began on August 10th, 1680. On that day the Indians began a well planned mass slaughter of the Spanish all throughout New Mexico. Greatly resentful of having been forced to work in the mines for years their vengeance knew no bounds. Walt's cannon was a leftover telltale relic of that horrific event. I took the photo of his cannon (shown above) out of a helicopter with a 500 millimeter telephoto lens from a great distance which explains some of the blurriness. At the time I had no idea that my camera had even captured it. After weeks of intense searching through some 20,000 aerial photos, I had taken of the area from high above the Black Range, the cannon suddenly appeared in one of them. It was all of six months after seeing it in that photo before we were able to once again pack back into the Black Range and actually find that same location on the ground. James McKenna, who was born in 1855 wrote about these same Lost Adams Diggings in his book Black Range Tales. While in his twenties, McKenna became the prospecting partner of Jason Baxter and together they searched for the Lost Adams Diggings. Although they never found it, McKenna wrote about an eerie woman painted on a mountain in brilliant colors who was connected to the Adams Diggings. He recorded her story which was told by a man named Jake Schafer who had gotten lost in the Black Range while serving under Capt. Tucker in 1872. Schafer eventually wandered out of the mountains and into Fort Craig with approximately ten pounds of gold nuggets in his haversack. According to McKenna, Schafer's gun was missing when he showed up at the fort. 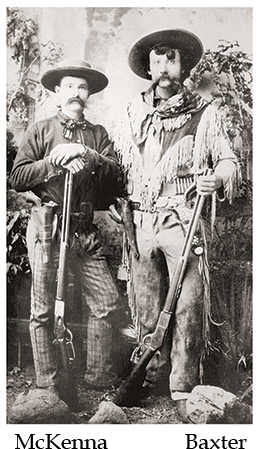 Over eighty years later Walt Nichols and another cowboy by the name of Gene Duncan accidently found Schafer's Spencer carbine in the Black Range. Having been fitted with a bayonet it was deeply embedded in a pine tree up near the divide. So much bark had grown around the bayonet that the two men broke part of it off in the tree while trying to pry it and the gun it was attached to loose. Schafer's story of the existence of a woman painted on a mountain in brilliant colors was thought to simply be a figment of his imagination. Never-the-less, seen only by the wild animals of the forest she was there all the time. Hidden in a remote, secluded and heavily forested area of the Black Range she appeared to float above the trees like some spooky apparition. For almost a hundred fifty years she had patiently sat always looking off to the north as if waiting for someone to come to whom she could reveal her unbelievable story. Eventually, in 1988 my son Jason and I did come and it was from the north. Our discovery of her existence was totally unforeseen. Her ghostly image, which was taken from a single frame from the now faded video seen above, which we filmed the day we found her, is seen on the front cover of Hidden Treasures of the Black Range. Gazing at her strange image that day gave me goose bumps and chills. 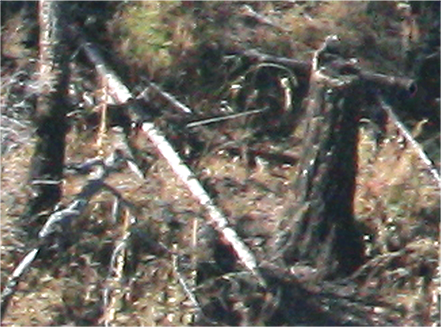 A photograph of her unfortunate destruction by a forest fire in 1996 can be seen among the over three hundred color photos in Hidden Treasures of the Black Range which clearly document that this treasure story is no wives tale. Within the pages of Hidden Treasures of the Black Range you can escape some of the anxieties of this life for a time. Come along with Larry and me on a fascinating adventure, the likes of which few people will ever get to experience in a lifetime. 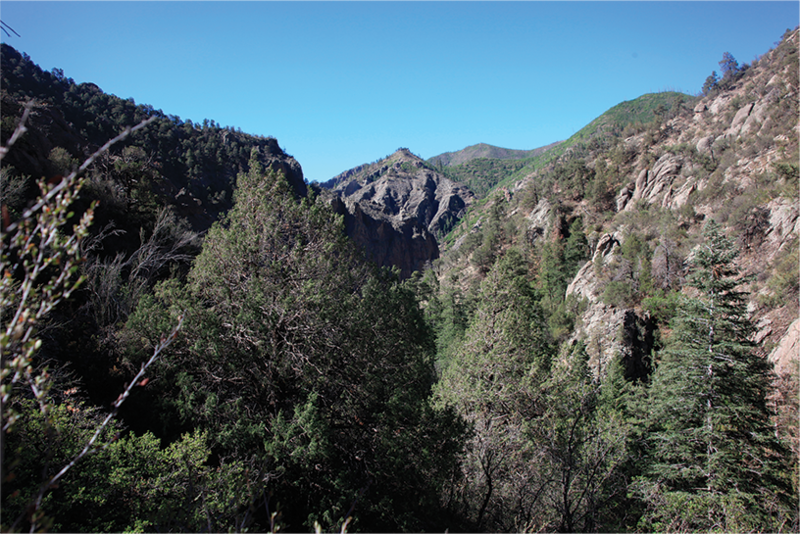 We will take you into a well hidden deep, dark, and ominous canyon in New Mexico's Black Range. Its referred to as Zigzag Canyon by Adams. This surreal place has seen few visitors since most of the Adams expedition was brutally massacred there in 1863. Both Larry and I sensed that this mysterious canyon had a story to tell the very first time we ventured into it through the secret door. Here the various weird and often unrecognizable sounds of the night come alive at the end of the day as darkness slowly invades this unforgiving chasm of great sorrow. Situated far below the towering rock walls above it, this canyon possesses a sinister unexplainable somber mood which becomes more apparent after dark. The bizarre occurrences in this place are exemplified by the creepy photos of several owls seen in our book with their eyes glowing in the dark as they followed us around in our camp one night. One of the photos of three of those owls can be seen below on the left, which may give you some sense of just how creepy this place can be. However, the large eerie image of the woman on the mountain seen below on the right was the strangest and most unsettling thing I have ever seen in my life. Seen below are two of several very weird and unexplainable images that showed up in our aerial photos taken deep in the Black Range. 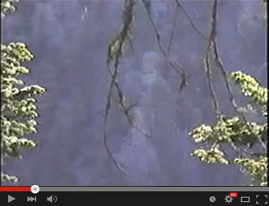 Although photographed from a considerable distance (and somewhat fuzzy) the one on the left looks like a monk while the one on the right appears to be an Indian woman grasping her hair while weeping on the side of the mountain. After Adams returned from California to look for the gold, thirteen years after being run out of the Black Range by the Apache, he made a disastrous error. He mistook Gila Peak across the border in Arizona for Cookes Peak on the southern end of the Black Range in New Mexico. This mistake caused Adams to spend the rest of his life searching for the lost gold mine (named for him) in places it never was. Frank Dobie's book Apache Gold and Yaqui Silver, which was his version of the story of the Adams Diggings, was first published in 1928. Dobie unwittingly perpetuated Adam's misguided account by publishing it in his book. This has caused virtually all those who have ever searched for the mine to look everywhere except where it is actually located. This extraordinary place has long held an incredible story of treasure, untimely death and treachery it has been willing to share with anyone who would take the time to observe and listen. Hiding a gold mine of unbelievable wealth this wretched canyon is an extremely treacherous place to enter. Even without the huge rattlers that permeate the area, just getting around in it is a life threatening experience as the photo of Larry crossing an unstable rock slide above Zigzag Canyon shows. In Hidden Treasures of the Black Range you can experience through our camera lens and written accounts a real sense of truly great adventure. According to our readers this 268 page hardbound beautiful man-made leather stitched 9 by 12 coffee table book is no ordinary book. Minnesota's one time governor Al Quie, said after reading Hidden Treasures of the Black Range, "This is a book you will never ever forget." Alan Dufty now 72, who moved out west from Iowa when he was only 18, told us, "I found this book so interesting I have read it four times." James Kay of Rye, Colorado said, "I am 62 years old. This is the first book I have ever read cover to cover in my entire life." Well known Tombstone historian Ben Traywick who has helped produce numerous films for the history channel, said, "Hidden Treasures of the Black Range is the most interesting treasure story I have ever read. Whether you would like to own one of these classic keepsakes for yourself, or you are looking for a very unique gift for someone special, order your copy today. 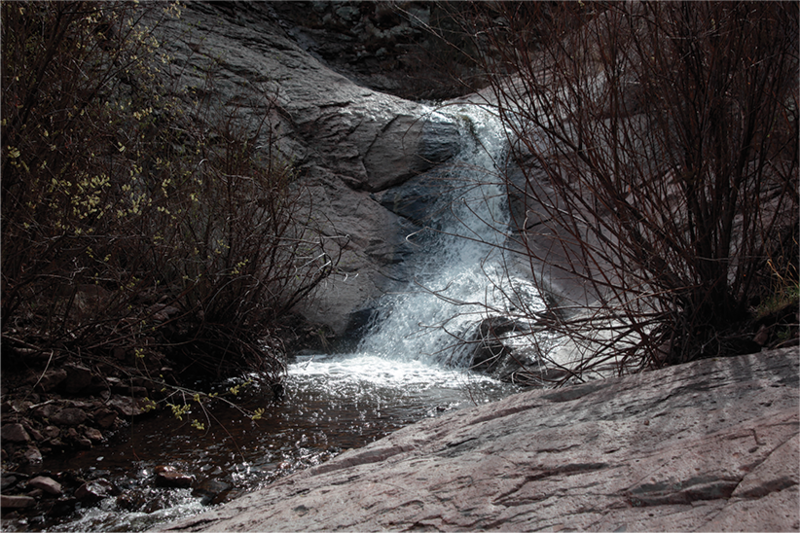 The low falls that were just above the spot where the Adams expedition had almost finished building their cabin just before the massacre. member, friend, or a valued business customer. This 268 page 9 x 12 man-made leather hardbound coffee table book has over 300 beautiful color photographs which are combined with old original quotes of the men who either knew Adams or had some connection to him and his fabulous lost gold mine. 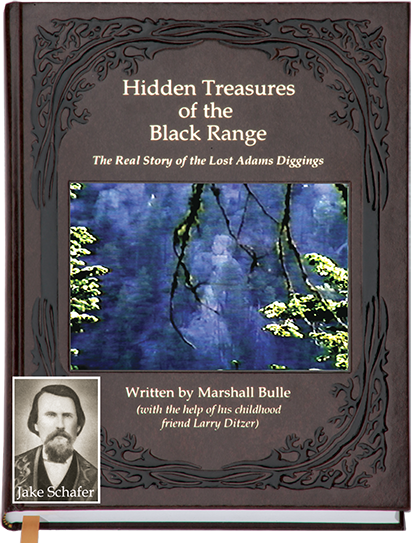 The evidence laid out in this book clearly show that the Lost Adams Diggings are located in the Black Range and not in any of the other places that some who have searched for her lost treasures have claimed. you hear about this book? and is individually boxed in the 1, 3 and 6 packs.